I felted these One Skein bowls this week & the color went all wonky on them. (Pattern from the book One Skein by Leigh Radford - affiliate link). The bowl on the left, in the rear, was bright red - it bled and lost almost all it's color - the greenish one in the front lost all it's vibrance, too -- this never happened before! When they're all dry, there's lots of fuzz to remove. I may also try dying the white/yellow one in back. Kook-aid or Lumiere dyes? I knit this dishcloth and started a second one today. 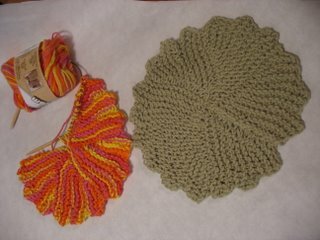 I forgot where I got this spiral dishcloth pattern - but I love it! So easy, maybe I'll start some more tonight during a movie. Spent last Saturday night making Halloween buttons for a local fundraiser - only one pack to show at my etsy site. I have to work on some new ideas for winter, too.